Needless to say, there were some pretty incredible tweets/status updates about Tebow yesterday. One in particular I found pretty solid was from a Jewish kid: “If the Broncos win the Superbowl, I’ll debate becoming a Christian.” However, with that being said, I’m not going to post about how much a winner Tebow is – at this point it’s a no brainer. Nor how much he sounds like he’s 12 when he does a post game interview – seriously though if he says “believe” one more time I might dropkick him. Actually, I’m going to talk about raw stats on this one. There is still a heated debate as to the success of Tim Tebow in the quarterback position; even Brian Urlacher made the comment last night that he was a “Good running back.” The CEO of BSB, none other than Jimmy Tully himself, enlightened me with some pretty interesting statistics that were featured on ESPN back in November, and I did some more research of my own to compare Tim Tebow and the greatest Denver Bronco in history, John Elway. In Elway’s rookie season, he amassed a 4-6 record in 10 starts, threw for 1600 yards and change, 7TDS, 14 INTs and had an abysmal 52% QB rating. In Tebow’s coming out party, he’s 7-1 in 8 starts, has thrown for 1300, 11TDs, 2INTs and boasts an 83.9 passer rating. 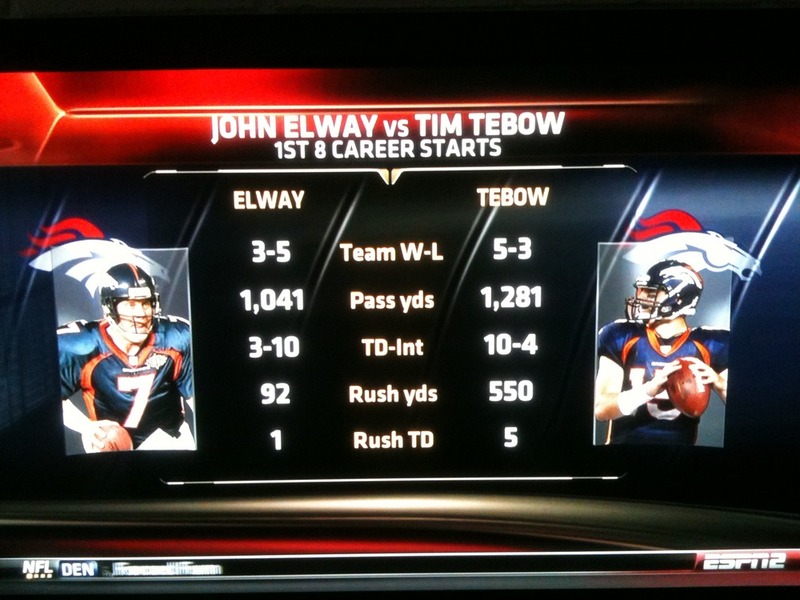 This also does not account for Tebow’s rushing skills, which if you could have guessed absolutely demolish Elway’s. I know that it is difficult to compare these two individuals, as Elway may have had more “Raw QB Talent,” but I think these numbers surprise even the biggest Tebow critic. The whole nation is rallying around this guy. Couple that with his will to win and his drive to improve? I like the sound of that. This entry was posted in Everything Else and tagged broncos, elway, jesus, nfl, tebow, winner by nolankartholl. Bookmark the permalink. Let’s not put his bust in Canton just yet!! !